After a busy few days I'm having a rest and not doing anything - that's except the washing oh and the tidying, not forgetting the washing up lol. But forgetting the roast dinner today! Yes there's been major tantrums over this - but hubby and I are standing fast and not budging, so It's a take away for us and the same for the children or they could always cook for themselves! Ha ha. A fairly tame evening at the birthday celebrations, and I felt so ill, OK hung-over! I didn't drink but drove, feeling very smug as today I've no headache. I ended up wearing the thrown-together-at-the-last-minute outfit I suggested on yesterdays post, see here. I know this looks like a dress but these are separate pieces, purely by chance they compliment each other and are a great match! A previously worn stretchy pencil skirt from Matalan. Just so cosy, but still with a bit of style and class paired with my recent purchase from Marks and Spencer see my post here. 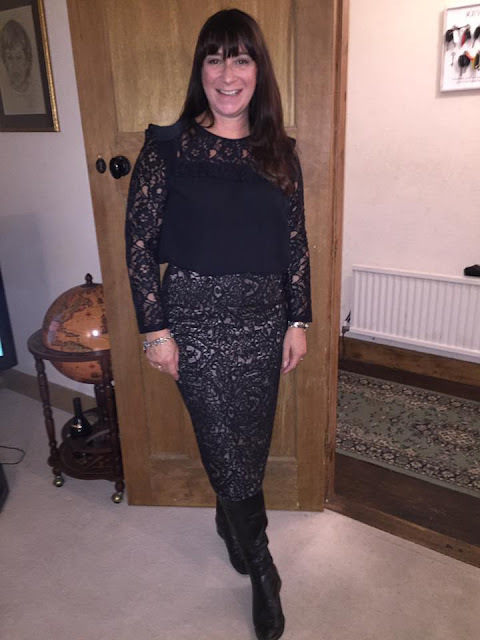 The ever popular Ruffle lace blouse that I've chosen to wear twice this week! I just couldn't wear heels last night after Friday night in very high heels, with not just the car to bar aspect, but a walk to the pub and having to stand for ages (OK maybe half an hour!) but long enough for toes to be numb from being squished! Worn for the first time this season my long boots, basic black flat boots are some times a god-send for achy feet, and an extra thumbs up I didn't need to wear tights - hem of skirt met and covered top of boots = warm legs, Yay! As I told you earlier I was at my BFF house for a birthday celebration. BFF sounds like we are about 12, but we have been friends since she was 12 and I was 13. We actually met in a tap dancing exam - one of our many funny moments, you see we went to dancing classes by the same teacher at different venues, we were the only people taking the exam so just the two of us in the room. We figured that because we started the dance in different corners of the room we must of been doing different dances, however once the music started the penny dropped and we were in fact doing the same dance! 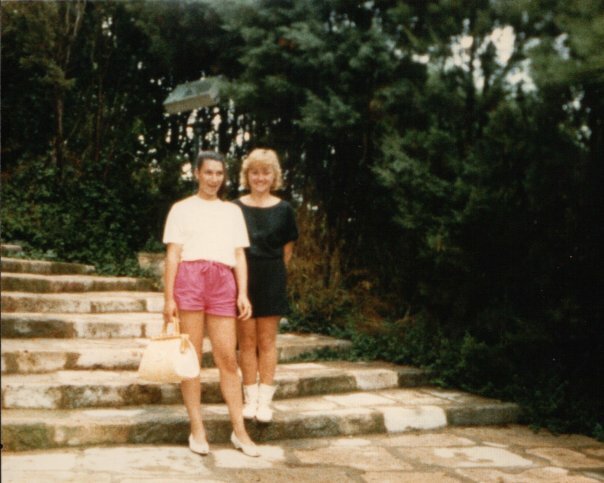 Taken in Spain 1984, so young, we often wonder how our parents let us out on our own!!! I hope you have a BFF in your life. Here's to another 40 years with mine. Just to add there's so many sales on now, I hope you're taking full advantage of them - I think I will! Linking up with Nancysfashionstyle and Beauty101bylisa. How wonderful that you have been BFFs for 40 years! I love your celebratory outfit! The top and skirt work perfectly together! That is amazing that you've remained so close with your BFF for so many years! I hope I can one day say the same about some of my best girl friends! What a lovely post! Thank you for linking up on Fancy Friday linkup!